Occurring on the 1st Friday of every month, this is one of The Diamonds of Burlesque popular regular shows that has been in operation since 2009 and still going strong. Serving up a seductive jam of sweet and saucy conserves at Marmalade Cabaret, The Diamonds showcase new and experimental Burlesque and Pole acts from new and well established Diamond performers. 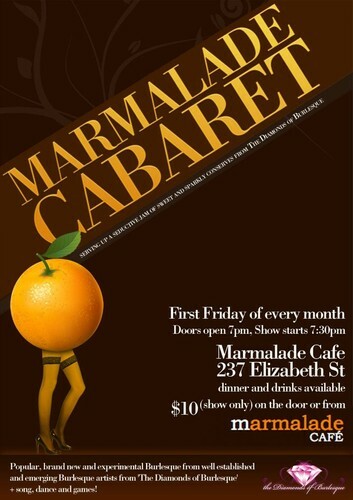 Try out Marmalade Cafe's delicious dinner menu during the show plus there's a well stocked bar to keep you well lubricated throughout the evening.